The AXA Cherto has a very good reputation. The chain lock should be flexible to use, yet safe.A combination that is very rare, since most bicycle locks are usually bulky, clunky and difficult with increasing security. Whether we could convince the chain lock, we find out in AXA Cherto test. In Stiftung Warentest 2015, the castle has received a score of 2, which is below the top places. 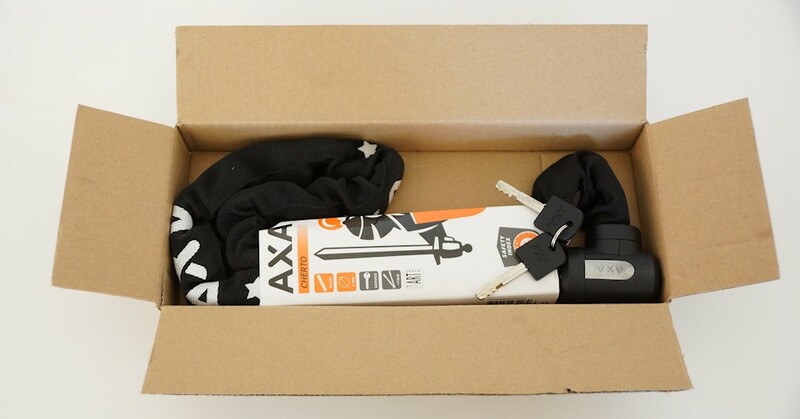 was delivered the Axa Chain Lock in a normal box with Axa overpack. With all there is what you need for mounting, except tool. The chain lock itself, the mount for the frame and a user manual. Moment which bracket? It included no support. 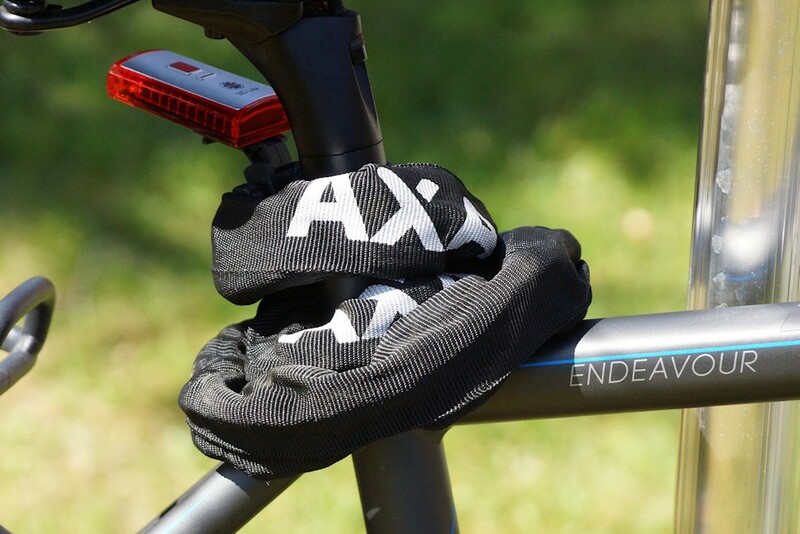 AXA assumes that secured the chain lock on the frame and like a snake wrapped two-three times around a frame tube. Absolutely no problem as it turned out later. Also present, two key. The chain lock consists of hardened steel links, you are reading this, expect a massive weight.It is precisely this expectation fulfilled the castle with its more than 2 kg. The chain is 9 mm thick and has a length of 95 cm. The chain itself can not be seen, it is covered with a cloth. The processing is clean. Special attention we have here the transitions of different materials. Here worked very clean. The fluorescent tube is fixed at the end with staples. This is a robust polyester sheath. In the hand, the chain lock Axa acts dibasic. The lock is opened with the key and can only be closed when the key is inserted in the cylinder. The key can only be pulled out when the lock is completed. This is regardless of whether the lock at the moment forms a CLOSED unit or open. If the key is pulled out of the castle, the Cherto 95 can not be put together. There is no closing resistor. One must make sure that the lock to is correct before you pull the key from the cylinder. To open you put the key into the lock cylinder and rotate these around 170 ° to the right. The castle is now open and can be pulled apart. When key there is no right side. 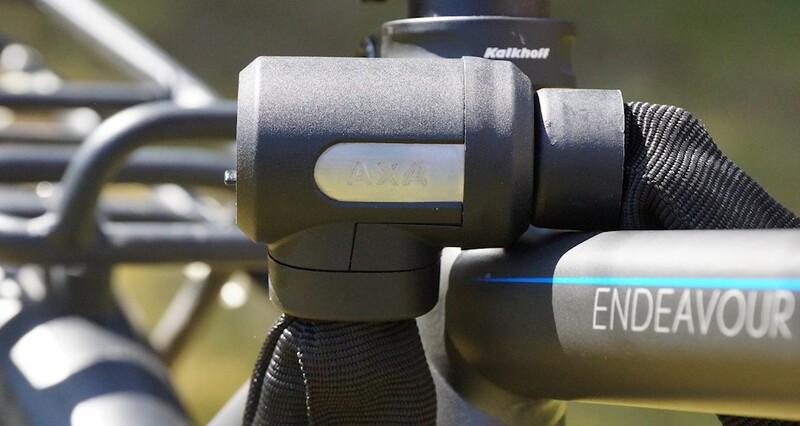 Anders such as the AXA Defender of the bike keys at AXA Cherto 95 can be inserted on both sides. The models that we have tested previously as the AXA Toucan and AXA FLC 800 already rely on a «turn key». We have the lock 30 times up straight and locked and did not notice any problems. The cylinder is protected by a sliding cover against the ingress of dust and dirt. Water will find its way here, so it is advisable to let the barrel pointing down. If you read reviews from buyers portals by asking other cyclists on their experience with the chain lock, often comes the indication that it would clamp and hook. This experience, we have not done so, although this is noticed us and what can be the reason for the sometimes difficult Unlocking the gate on the lock cylinder. If you push the plastic cover to the side one takes a diaphragm (see figure). This diaphragm is not in accordance with the position of the core pin, so the interior of the locking cylinder. The diaphragm is movable. If this is now moving, you do not get the key difficulties to the lock.Only when one positioned exactly this bezel before the locking cylinder, the key can be easily inserted into the lock. Plus points collects the chain lock because of its flexibility. It is very easy to carry out the various bicycle parts such as frames and wheels. The shell of the chain ensures good protection from scratches. A small, but good point is that you can put into the lock the key on both sides. Of this one benefits whenever you have open at night the castle and little looks. With its 95 cm length the AXA Cherto is just long enough to allow the bicycle on its frame to another object such as a streetlight to join. If you have swung the castle to the Rağmen, it is quite the «jingle», you go over a bump. Here notes and hear the chain lock. 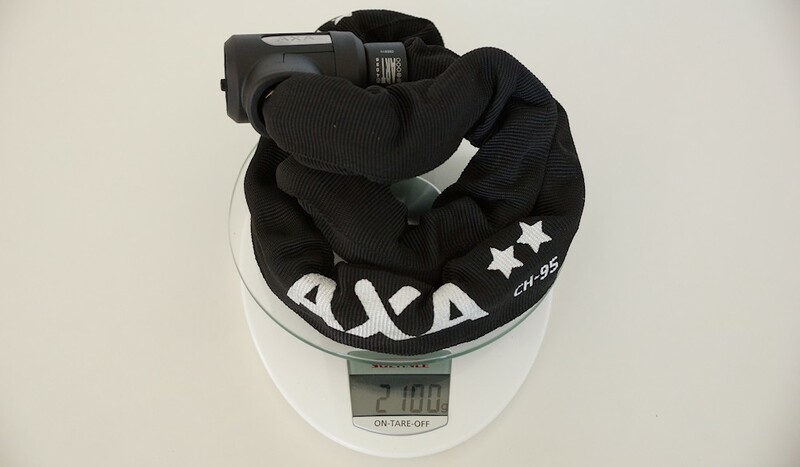 Point deduction, there are very clear to the weight of 2.1 kg. The manufacturer must indicate here an approximately weight of 1,950 g. We are with our model so 150 g (approximately 7.7%) on the manufacturer’s specification. There are lighter bike locks which are also as safe as the AXA cherts. For example, the Trelock FS 455 or the Abus Bordo Big , both locks are settled priced higher. Overall, 95 of Cherto AXA gets a rating of 4.3 out of 5 points.